Whether you eat it with a spoon, a fork, or chopsticks, there’s no denying how tasty a big bowl of ramen can be. 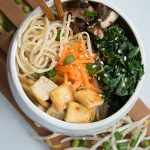 This Vegan Ramen Bowl recipe is full of fresh veggies, is super filling, and can be made quickly! Flavour aside, one of our favourite things about this recipe is how colourful it is. Between the bright orange carrots, stark white bean sprouts, and dense green bok choy, it’s a regular rainbow! Of course, you can add your own spin by using whatever veggies you like, but these are our favourites. 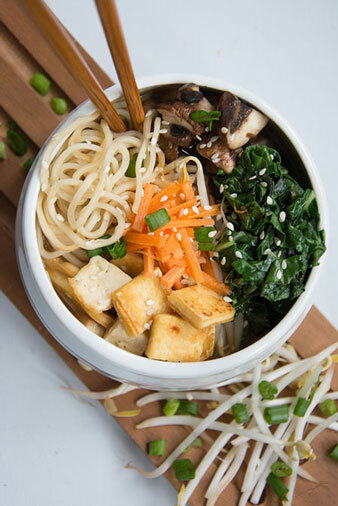 We like to think our Vegan Ramen Bowl marries the lightness of summer with the soupiness that is winter. AKA, it’s the best of both worlds! The secret to getting the most out of this soup is making your own vegetable broth. You can definitely used the boxed stuff, but the intense flavours from making your own really take this to the next level. So on your next girl’s night, date night, or solo night, why not try making this ramen recipe? You’ll thank us! In a frying pan, heat sesame oil and soy sauce on medium heat. Add tofu and fry until golden, about 10 minutes. Remove tofu from the pan. In the same pan, add mushrooms and bok choy and stir until the bok choy begins to wilt. Remove from heat. In a large pot, bring vegetable broth, miso paste, and salt to a boil. Add lo mein noodles and cook until soft, about 3 minutes. Add tofu, mushrooms, carrots and bok choy, stirring until well combined. Serve topped with bean sprouts.